This is a most flavorful and aromatic rice that is called کلم پلوبا کلم قمری وگوشت قلقلی kalam polow Shirazi in Persian, and it is a wonderful dish from the beautiful ancient city of Shiraz, Iran. 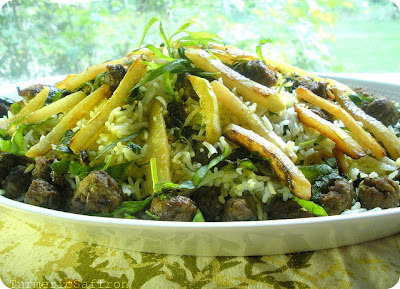 This delicious rice is layered with tiny and tasty meatballs, a combination of fragrant fresh herbs such as basil, tarragon and savory and then topped with kohlrabi fries. I heard about this recipe from a very kind and generous Shirazi friend of mine, Shahla khanoum, back in the spring and since then not only have I enjoyed making and serving kalam polow but I have also learned to love kohlrabi and it's now my new favorite vegetable. 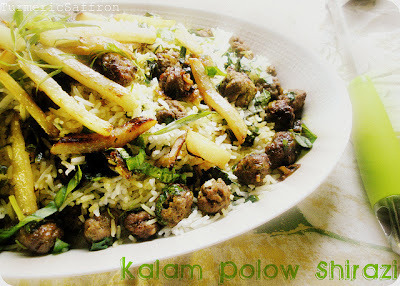 This rice can be made with cabbage as well but the flavor and texture of kohlrabi turns this dish into a more delightful blend of aromas, flavors and textures. In a medium-sized bowl combine ground beef, chickpea flour, salt and pepper, mixing well. Shape into small meatballs. In a skillet, heat 2 tablespoons of olive oil and lightly saute the herbs together over moderately low heat for 2-3 minutes, just enough for the flavors to come together. Don't fry these herbs and, if you prefer, you can skip this step altogether and layer the rice with fresh herbs. If you are using dried herbs, soak them in a bowl of water for about 20 minutes, discard water, towel dry any excess water before sauteing them. In a large frying pan, heat 5-7 tablespoons of oil on medium-high heat. 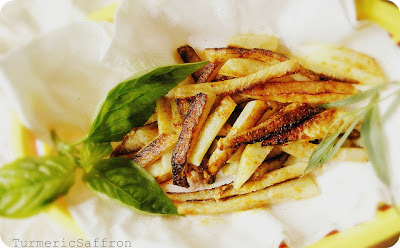 When hot, add the kohlrabi fries and cook for 4-5 minutes, turning them a few times until golden brown. Remove them with a slotted spoon and place on a paper towel. Sprinkle salt to taste. Add a pinch of cayenne pepper if you like. Wash rice with cool water a few times and soak rice in 8 cups of water and some salt for 2 hours. In a large pot bring 3 quarts of water to a boil on high heat . Drain rice and gently pour into the boiling water. Bring water back to boil for 7 minutes. Test the rice to see if it's done -- rice grains should be soft on the outside and firm on the inside. Drain and rinse with cool water. Clean out the pot and return to the stove, add 4 tablespoons oil to the pot on medium to high heat. 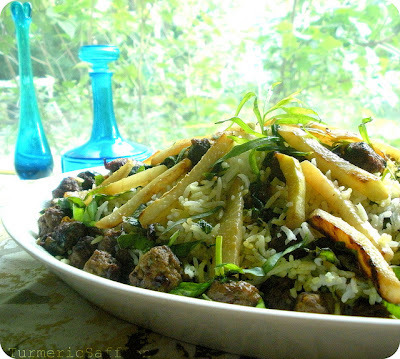 With a spatula, place rice in the pot, layer it with herbs, meatballs and some of the fries, building it into a pyramid shape. Make 3-4 holes in the rice to let the steam out. Cook for about ten minutes or until the steam starts to come out, pour 2 tablespoons oil, 1/4 cup of water over the rice, lower the heat, cover and cook for 45 minutes. Serve rice on a platter, top with the rest of the kohlrabi fries and garnish with chopped fresh herbs. It may be served with yogurt, salad, pickles (eggplant torshi). The use of kohlrabi for the rice is really intriguing ! I love the idea of kohlrabi fries, a delicious dish here! Beautiful pictures too! In the water for soaking rice, you mention "some salt". How much salt do you use. actually? Do you stop once the water tastes salty enough? Since you already soak in salt, is it enough to salt up the rice for this dish till its completion? Amarnath, thanks for visiting and commenting. In Persian cooking, rice is usually soaked in salted water for at least an hour before cooking since this will soften the rice. Your method is fine too. For each cup of rice I usually add 1-2 tablespoons of salt. I then drain the rice, and add it to the boiling water till the rice softens and drain the rice again and rinse it with cool water before returning it to the pot to steam it. I add salt and oil directly to the water when I am making a simple and easy rice called "katteh" that doesn't require any soaking or draining. A lovely dish and stunning photos. Kohlrabi fries! You made my day. 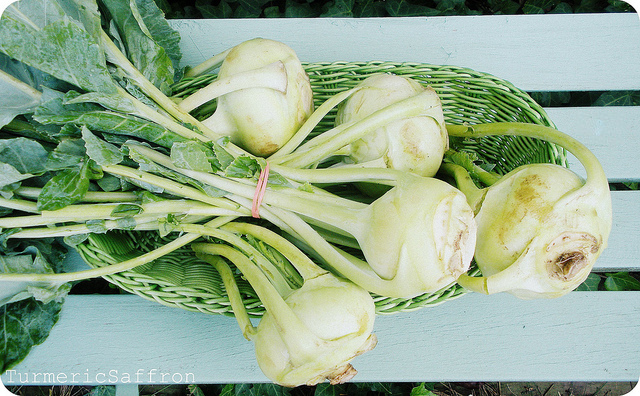 Kohlrabi is one of my favorite vegetables, but so rarely given the praise it deserves. Cannot wait to put this recipe to use. bah bah bah! che bloge zibayi! sepas gozaram! Oh my, I can't wait to make this. I love learning about foods from different regions of Iran. Thank you for posting these amazing recipes. Ive never seen use of basil in Iranian cuisine. Do they use basil for this recipe in Iran too, or do you use basil as a substitute for a herb that is not available in the West? Just curious. Bob and Ghazaleh, according to my friend who kindly gave me the recipe they use fresh basil in this recipe in Shiraz, Iran. Tried it today. Lovely recipe. Added some spices, egg, union, and slice of bread to the meatballs to add some more flavour to the mb. Thanks for sharing this. Keep up the good work.